This article is about Pala King. For other uses, see Dharmapala (disambiguation). Dharmapala (ruled 8th century) was the second ruler of the Pala Empire of Bengal region in the Indian Subcontinent. He was the son and successor of Gopala, the founder of the Pala Dynasty. He greatly expanded the boundaries of the empire, and made the Palas a dominant power in the northern and eastern India. Dharmapala directly ruled over the present-day Bengal and Bihar, and installed a nominee at Kannauj. The Pala chronicles also claim that several other rulers of North India acknowledged his suzerainty, but these claims seem to be exaggerated. Dharmapala was defeated twice by the Gurjara-Pratiharas, but each time the Rashtrakutas subsequently defeated the Pratiharas, leaving Palas as the dominant power in North India. Dharmapala was succeeded by his son Devapala who further expanded the empire. Dharamapala directly ruled over the present-day Bengal and Bihar regions. Since the extent of Gopala's kingdom is not known, it is uncertain if Dharmapala inherited these territories or acquired them through conquests. The Kannauj dispute resulted in a struggle between Dharmapala and the Pratihara king Vatsaraja. Vatsaraja defeated Dharmapala in a battle fought near Prayag. Shortly after this, Vatsaraja himself was defeated by the Rashtrakuta king Dhruva of southern India. After Vatsaraja's defeat, Dharmapala regained the control of Kannauj, but was defeated by Dhruva. However, soon after this, Dhruva returned to his southern kingdom, and thus, Dharmapala did not lose much in this quick chain of events. These events had left the Pratiharas badly mauled, which indirectly helped Dharmapala. 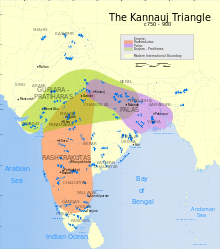 After Dhruva's death in 793 CE, the Rashtrakutas were weakened by a war of succession. Taking advantage of this situation, Dharmapala recaptured Kannauj and placed his vassal Chakrayudha on the throne. He became the most powerful ruler in North India, and declared himself as Uttarapathasvamin ("Lord of the North"). According to the Monghyr (Munger) copper plate, Dharmapala offered prayers at Kedar (possibly Kedarnath) and Gokarna (variously identified with Gokarna in Nepal, Gokarna in Karnataka or a place in Orissa. This indicates that his position as a sovereign was accepted by most rulers, although this was a loose arrangement unlike the empire of the Mauryas or the Guptas. The other rulers acknowledged the military and political supremacy of Dharmapala, but maintained their own territories. One tradition also claims that Nepal was a vassal state of the Pala Empire during his reign. Sometime later, Dharmapala faced another attack by the Gurjara-Pratiharas. Vatsaraja's son Nagabhata II conquered Kannauj, making Chakrayudha his vassal. This brought Dharmapala and Nagabhata II into a military conflict near Munger. Dharmapala suffered a defeat, but in a repeat of history, the Rashtrakutas invaded the Pratihara kingdom. Nagabhata II was defeated by the Rashtrakuta king and Dhruva's son Govinda III. Govinda III then proceeded to Kannauj, and subdued both Chakrayudha and Dharmapala. Like his father, Govinda III then returned to his kingdom in the south. Once again, Dharmapala re-established his authority in North India. Dharamapala remained the dominant ruler in North India till the end of his life. Dharmapala ruled for about 40 years, and was succeeded by his son Devapala. Somapura Mahavihara is the largest Buddhist vihara in the Indian Subcontinent built by Dharmapala; it became a World Heritage Site in 1985. Dated in the 26th regnal year, this inscription is a work of Kesava, who was the son of sculptor Ujjala. It records the establishment of an image of Chaturmukha (four-faced) Mahadeva and the excavation of a lake at the cost of 3000 drammas (coins) at Mahabodhi. Dated in the 32nd regnal year, this copper plate is inscribed by Tatata, who was the son of Subhata and grandson of Bhojata. It records Dharmapala's defeat of Indrayudha and the installation of his tributary Chakrayudha at Kannauj. It states that the kings of Bhoja, Matsya, Madra, Kuru, Yadu, Yavana, Avanti, Gandhara and Kira (possibly Kangra) attended the imperial assembly and approved it. It further states that Dharmapala granted four villages to a feudal lord called Naryanavarman for the construction and maintenance of a temple dedicated to the Lord Nanna-Narayana, with the boundaries of the donated villages including a shrine constructed for the Goddess Kadamvari. This plate is partially damaged due to burning. The name of the donor is not clear, but his father's name is Dharmadatta. It records the gift of a village Uttarama, situated in the Gaya visaya (district) of the Nagar bhukti (division). This inscription is a work of the artisans Kese, Savvo, Vokkaka and Viggata. It is inscribed on a stupa sculpture with carvings that depict seated Buddha figures. It records Vairochana as the person who commissioned this deed, describing him as a brilliant and valiant man who lived during the rule of Dharmapala. It records the dedication of an image of god Madhusrenika by Ajhuka, the wife of Sato, in the city of Krimila. These two seals were discovered from the Somapura Mahavihara. Both depict a dharma chakra flanked by antelopes, and state that they were issued by the monks belonging to a vihara at Somapura, which was established by Dharmapala. ^ a b c Susan L. Huntington (1984). The "Påala-Sena" Schools of Sculpture. Brill. ISBN 90-04-06856-2. ^ a b Sailendra Nath Sen (1999) [First published 1988]. Ancient Indian History and Civilization (2nd ed.). New Age International. pp. 278–279. ISBN 978-81-224-1198-0. ^ a b c d Ronald M. Davidson (2004) [First published 2002]. Indian Esoteric Buddhism: Social History of the Tantric Movement. Motilal Banarsidass Publ. pp. 53–55. ISBN 978-81-208-1991-7. ^ a b c Nitish K. Sengupta (2011). Land of Two Rivers: A History of Bengal from the Mahabharata to Mujib. Penguin Books India. pp. 41–42. ISBN 978-0-14-341678-4. ^ George E. Somers (1977). Dynastic History Of Magadha. Abhinav Publications. pp. 177–. ISBN 978-81-7017-059-4. ^ a b Pramode Lal Paul (1939). The Early History of Bengal (PDF). Indian History. Indian Research Institute. p. 38. Retrieved 28 March 2014. ^ Sailendra Nath Sen (2013). A Textbook of Medieval Indian History. Primus Books. p. 20. ISBN 978-93-80607-34-4. ^ Ancient India, 2003, p 648-49, Dr V. D. Mahajan. ^ Syayambhu Purana; Ancient India, 2003, p 649, Dr V. D. Mahajan. ^ Jhunu Bagchi (1993). The History and Culture of the Pālas of Bengal and Bihar, Cir. 750 A.D.-cir. 1200 A.D. Abhinav Publications. pp. 8–9. ISBN 978-81-7017-301-4. ^ Sikha Sarkar (2001). Mother-goddess in Pre-mediaeval Bengal: A Study of the Evolution of Concept & Forms of Female Divinities. Niharendu Aditya. p. 37. The Khalimpur Copper-plate, issued in the 32 regnal year of the great Pala king Dharmapala gives us the information regarding the erection of a temple of the Bhagavana (Lord) Nanna-Narayana by a feudal lord (Mahasamantadhipati) Narayanavarma. Scholars are unanimous regarding the fact that Nanna-Narayana is the name of Lord Visnu. ^ Ramesh Chandra Majumdar (1971). History of Ancient Bengal (PDF). G. Bharadwaj. p. 511. A temple (deva-kula) of the god Nanna-Narayana is referred to in a record of Dharmapala (B.2), while the Garuda Pillar Inscription at Badal (B. 20) shows its continued importance, during the reign of Narayanapala. ^ Sikha Sarkar (2001). Mother-goddess in Pre-mediaeval Bengal: A Study of the Evolution of Concept & Forms of Female Divinities. Niharendu Aditya. p. 37. While describing the boundaries of the donated villages, the copper-plate grant refers to a small shrine constructed for the goddess Kādamvarī: "uttareṇa kādamvarī devikulikā khariuravrksaśca" (line 32). It is said that there is a small temple of the goddess Kādamvarī on the northern boundary of the village mentioned above. The name of this goddess is rarely found in the Epics and the Puranas. Pankaj Tandon: "A Gold Coin of the Pala king Dharmapala," Numismatic Chronicle, No. 166, 2006, pp. 327–333. This page was last edited on 20 October 2018, at 19:12 (UTC).